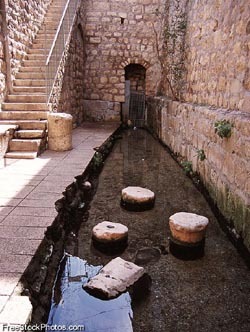 One of the miracles that Jesus performed involved the Pool of Siloam. As explained in the Gospel of John, chapter 9, Jesus healed a blind a man by putting mud on his eyes and then telling him to wash his eyes in the Pool of Siloam. The blind man did this and his sight was restored. The account of this incident can be found in John 9:1-11. The Pool of Siloam is located in the original site of Jerusalem, and is now located outside of the walls of the Old City. One of the sources of water for the pool is the tunnel that King Hezekiah built about 2700 years ago. Hezekiah commissioned the construction of the tunnel to channel water from the Gihon Spring to the city of Jerusalem, as a way to help the city survive an attack by the Assyrians. Siloam (Pool of Siloam) appears in 3 Bible verses: Luke 13:4, John 9:7 and John 9:11.